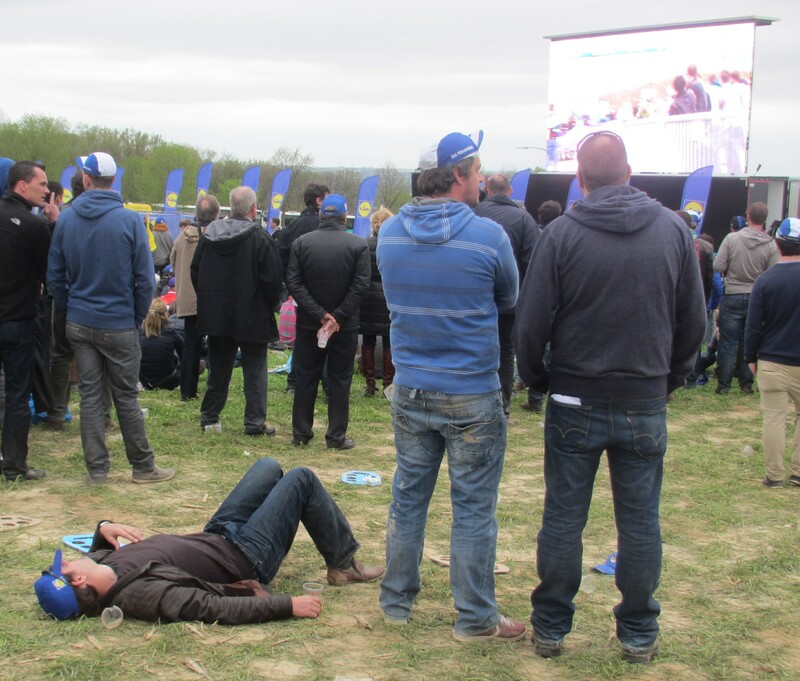 I was not sure how to watch the Tour of Flanders this year. As I was going on my own I had concluded that this was probably a good day for a long spring ride from home. I would then rest at a vantage point and ride home, making perhaps my first 100 mile ride for a long time. I probably should have looked a bit more closely at the “work on my personal condition” part of the invitation as Vincent is a faster rider than me, but the prospect of company and somebody to map out a route between vantage points was too good to miss. 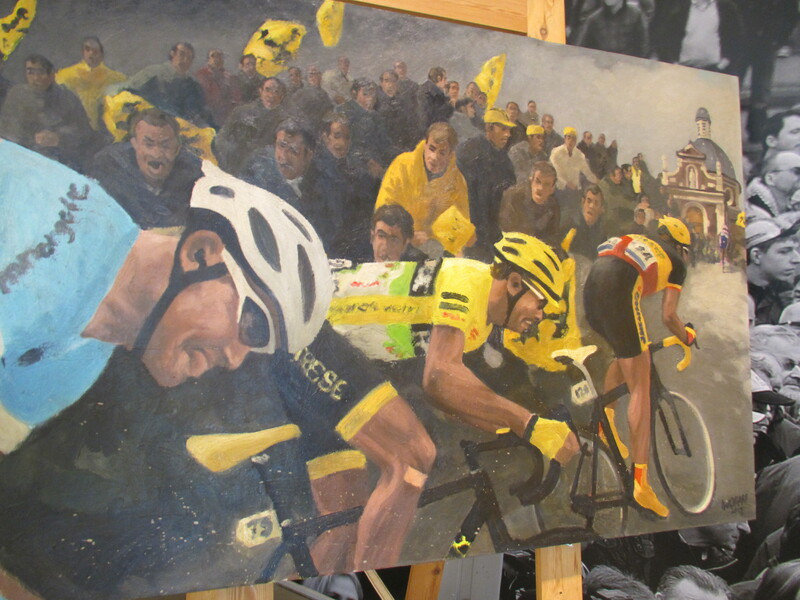 I also knew that it would be great to ride with real fans, local riders with a passion not only for the Flemish riders but “their race”, the culmination of a season of Flanders mini-classics on their roads which build up over several weeks and culminate in the Ronde. The arrangement was quickly made that I would go by train to Ghent, meet the guys and we would ride down to the course. 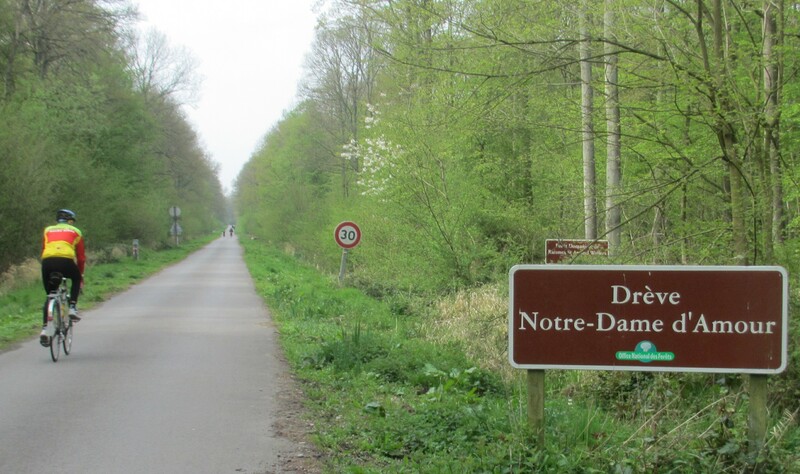 This is relatively easy in Belgium because once you have bought your 24 hour bike ticket you have unlimited access to the rail network for the bike, it is not the lottery experienced in many countries. So I could plan to jump on a train home from any number of stations in the area without hassle. 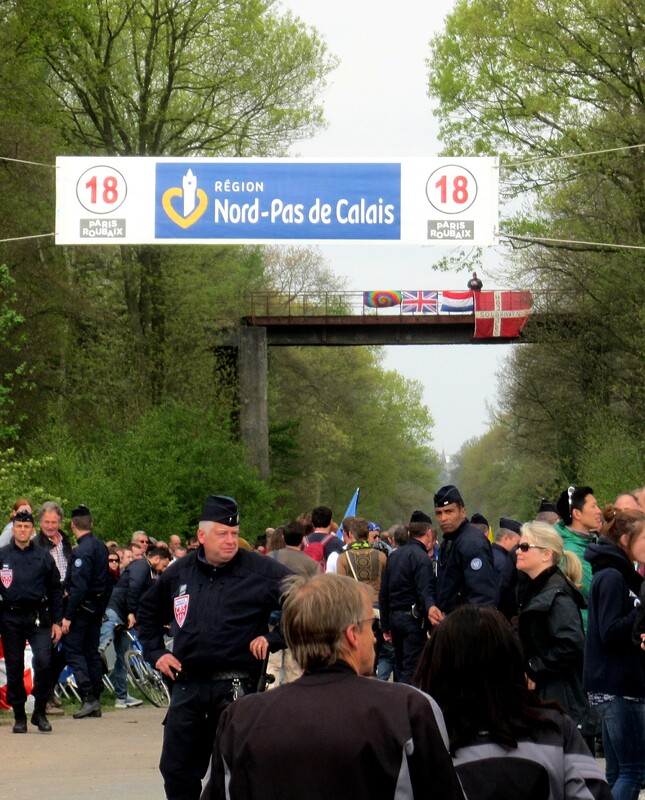 The Tour of Flanders is one of the most spectator friendly races in the professional cycling calendar. Many of the great bike races flash by from place to place and the only way to watch is to chase the race by car or soak up the atmosphere and watch the rest of the race in a bar. 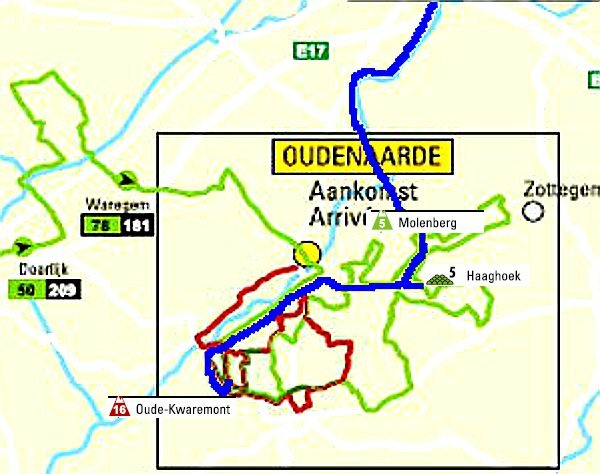 With the Tour of Flanders the organisers give flat West Flanders a taste by sending them off into the flat country for 100 or more kilometres, then they bring the race into the Flemish Ardennes and pack 150 km of racing into a small range of steep sided hills just 20km long by 10km wide. This is done by a complicated set of loops and laps which mean that cars find it hard to move almost anywhere in the network of lanes but by bike it is easy to plot a route to see the race several times if you have some local insight. The organisers also cater for the spectators brilliantly by running shuttle buses up to three spectator villages with food, bars and big screens at the main vantage points. 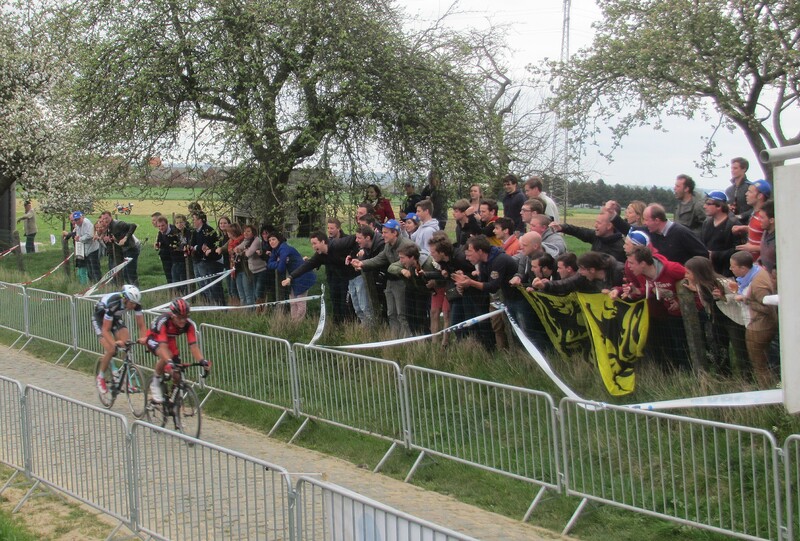 It is quite unique in sport, the crowd encouraged away from the towns into fields beside tiny villages. And instead of grumbling about the inconvenience and the intrusion the local communities fill many of the gardens with their friends, get out the beer and the barbeque and welcome their race. Our ride was a bit of a mini version of the race route which I have crudely sketched on to the map below (Blue line) By starting from Ghent we would mirror the elites by riding straight into the stiff south westerly breeze. Near to Oudenaarde we swing south into the hills to the Molenberg. 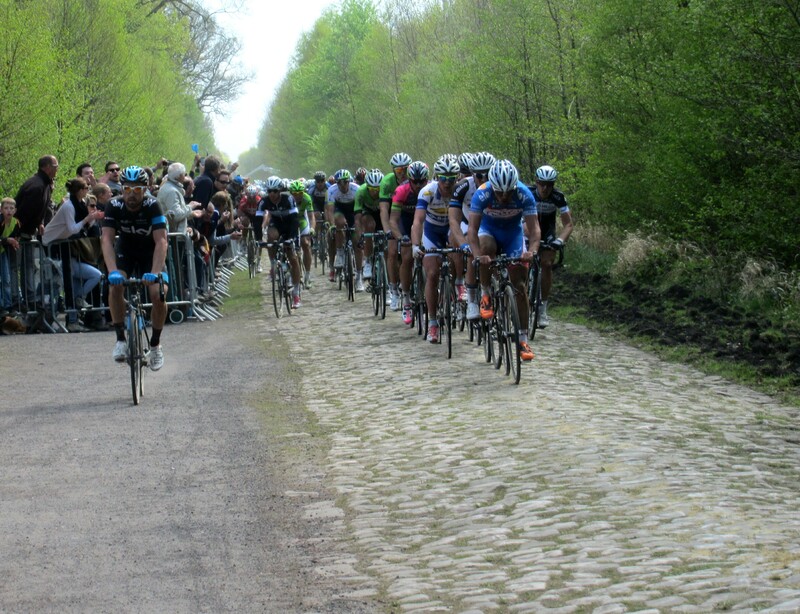 From there apparently there was just enough time if we hurried to catch them again on the cobbled section at Haaghoek before a 10-15km ride to the Oude Kwaremont where we should see them twice and watch the race unfold on the big screen. About 80km/50miles I estimated for that part, my whole day was around 75miles/120km. This route was really good because I would never have chosen the Molenberg or Haaghoek to watch, I just didn’t have the knowledge of what to expect and they come early in the action. As it turned out they gave me some new experiences because the top of Molenberg was a tiny lane with the bunch funnelled down right in front of people’s gardens whereas the section at Haaghoek was a wider cobbled road across a shallow valley with a great view of the whole race cavalcade rattling down the stones and sweeping up in front of fans two deep on the railings. 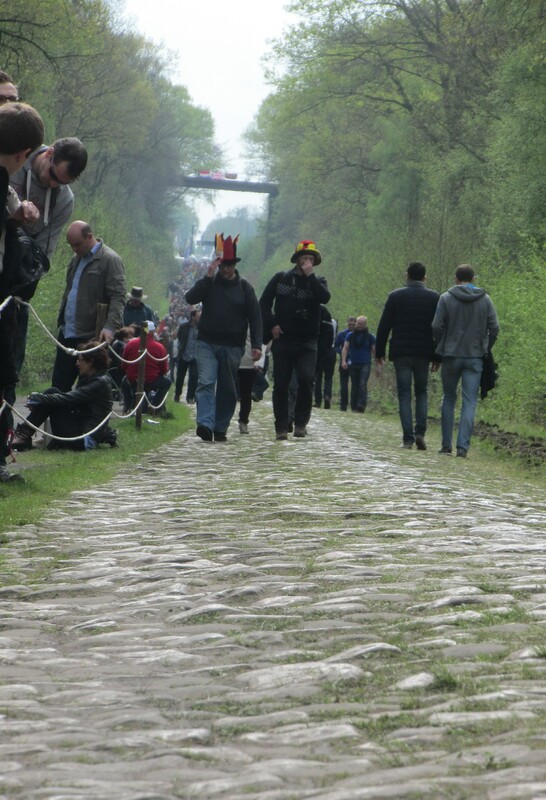 The Oude Kwaremont is at the other end of the spectrum, one of the famous and decisive climbs with just 20km to go in the race. 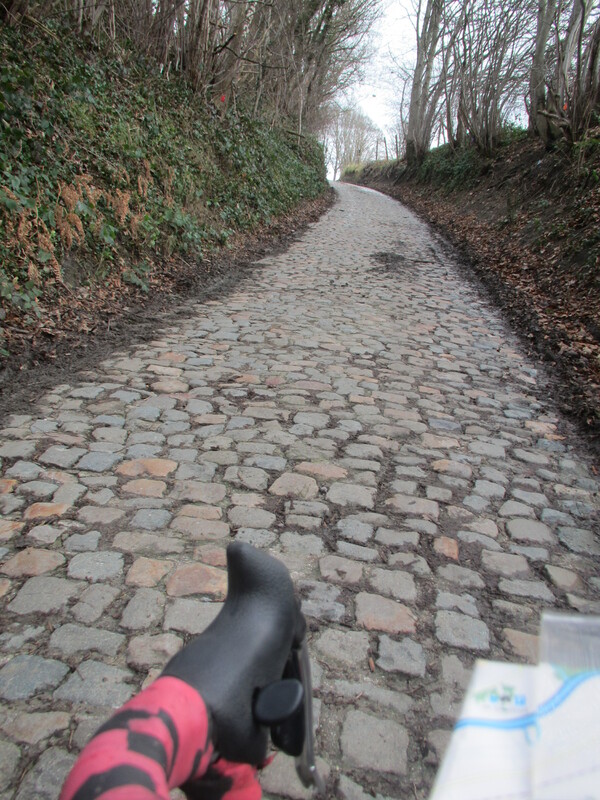 I have ridden it and it is nowhere as steep as the Paterberg or the Koppenberg but it just seems to go on for ages, all cobbled. It is ridden 3 times and at the end it is a great place to see the favourites impose themselves. 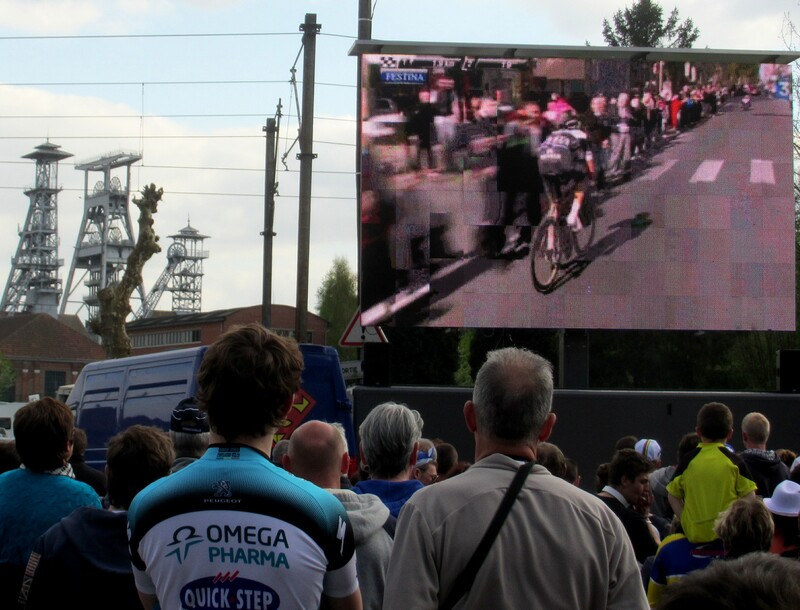 For that reason it is of course popular, with a big spectator village at the top and you have to fight for a view at the roadside, but then we can all watch the finale. 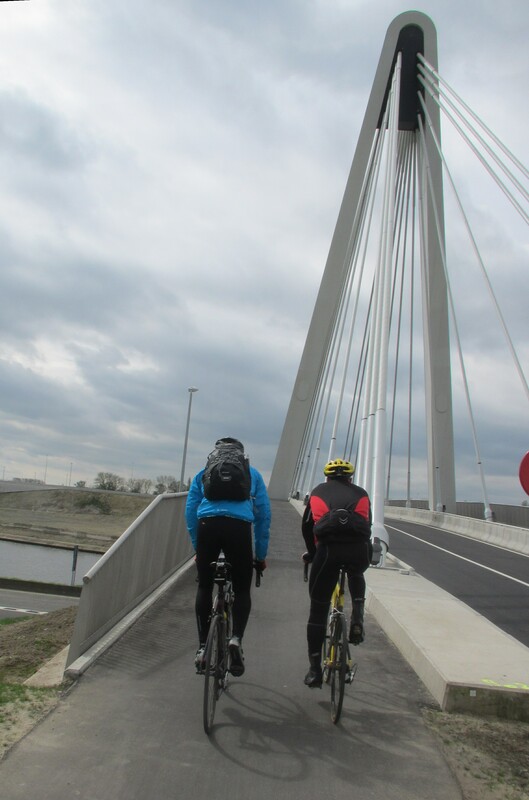 To get out of Ghent we nipped through the suburbs and then up and over a superb new cyclists suspension bridge which has been built over the motorway as part of the access to a new football stadium. The stadium itself has an impressive mobility plan which encourages local fans to come by bike with lots of cycle routes and cycle parking. 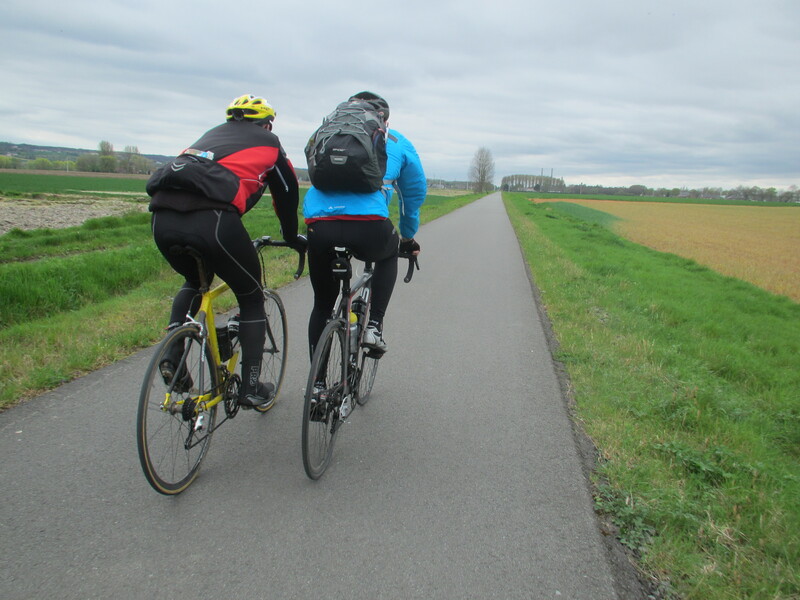 We quickly joined the flat car free route beside the Scheldt river (hope of the infamous ribbelstroken) and soon knocked off the kilometres towards Oudenaarde. I was already grateful for the company given the surprising strength of the wind, especially when I realised that my original plan would have seen me riding 50 miles into this on my own. Leaving the riverside we were quickly zig-zagging through a maze of lanes that I would never have found on my own and relatively rapidly came up a tiny side road to the top of the Molenberg. Everything seemed very quiet, then suddenly the final climb was covered in parked cars, telling us the race route must be nearby. Great navigation because we popped out right at the top of the village and joined a mix of locals and visitors by the roadside, all being handed flags with the black lion of Flanders. The next part of the ride was the hardest because after standing around for half an hour we suddenly had to dash across several small folds in the landscape and by the time we reached the top of the final one my legs were groaning and my lungs gasping to keep up with Vincent and Wouter. We actually got to ride a very short stretch of the course just ahead of the race as we cut through but we were mainly on some lanes which looked lovely with the spring blossom everywhere, a year ago I watched under snowflakes and spring seemed quite distant. 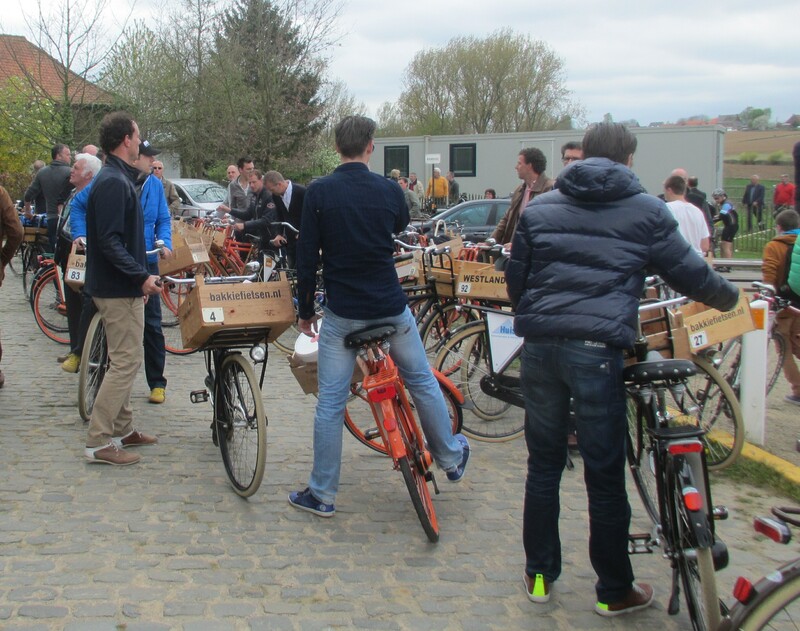 A good crowd was gathered at Haagenhoek because of the excellent views and the extremely well placed bar where the party of Dutch cargo bikers were refuelling. 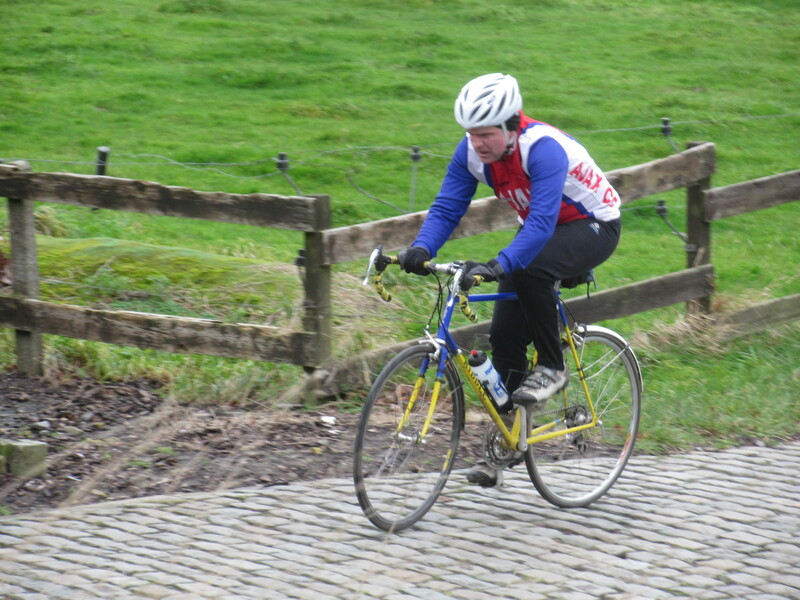 We weren’t there long before the race came through so this time I didn’t stiffen up so much before we were back on the bikes to ride a longer section to the Kwaremont. Again the benefits of local knowledge were apparent, would I have gone down an apparent footpath between two houses without Vincent leading? No chance! The stiff wind was still in our faces but by now it was clear that Wouter is a strong rider into the wind so I was happy to be tucked up behind them when we cleared the lanes and joined an excellent cycle route that ended up on an former railway line that sliced across the open fields in the flat valley of the Scheldt. This was a good way of taking in the topography of the area because as we rolled west the hills of the Flemish Ardennes were lined up to our left and we could look across and spot the bergs, knowing the riders were out there somewhere sweeping up down and around the fiendish final 100km of the race. Our route cut right across the foot of the awesome Koppenberg that completely defeated me earlier in the year so we stopped for a photo-call to prove we were there, but maybe another time for the climb. 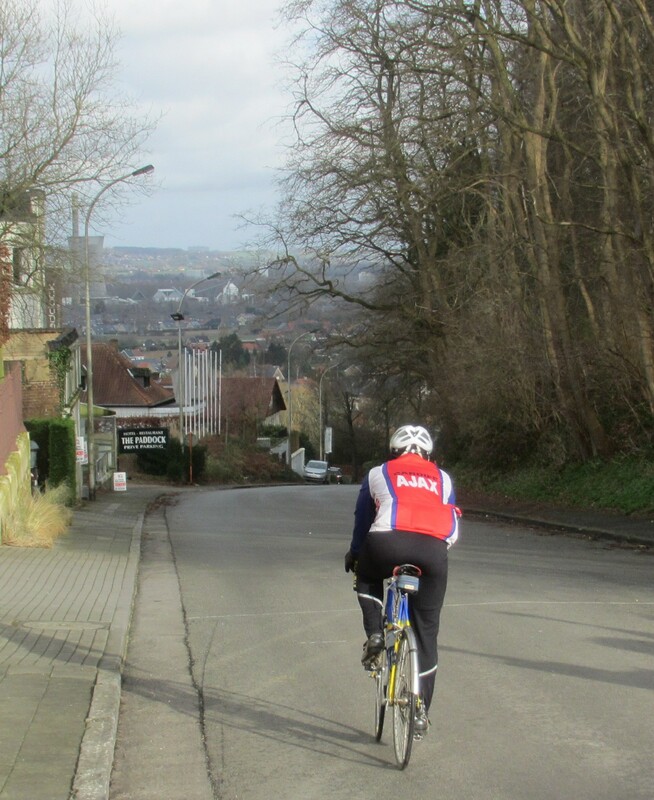 Shortly after the foot of the Koppenberg we were into Berchem, the small town below the village of Kwaremont which looks down over the valley. 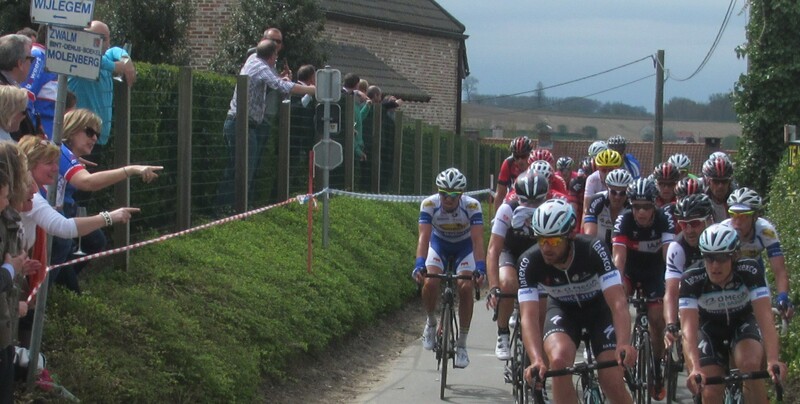 We were running a bit tight for time to get up the climb before the riders so the suggestion was a detour to watch the field come down the new main road which bypasses Kwaremont. This turned out to be inspired because again we saw another aspect of the race that none of us had seen before. The bunch was jockeying for position before the key climb which means that they spread out across the whole road and descended past us at just extraordinary speed. (80kmph/50mph at least) Given that they were only a few metres from a road narrowing and a sharp right hand bend the sight was even more terrifying. 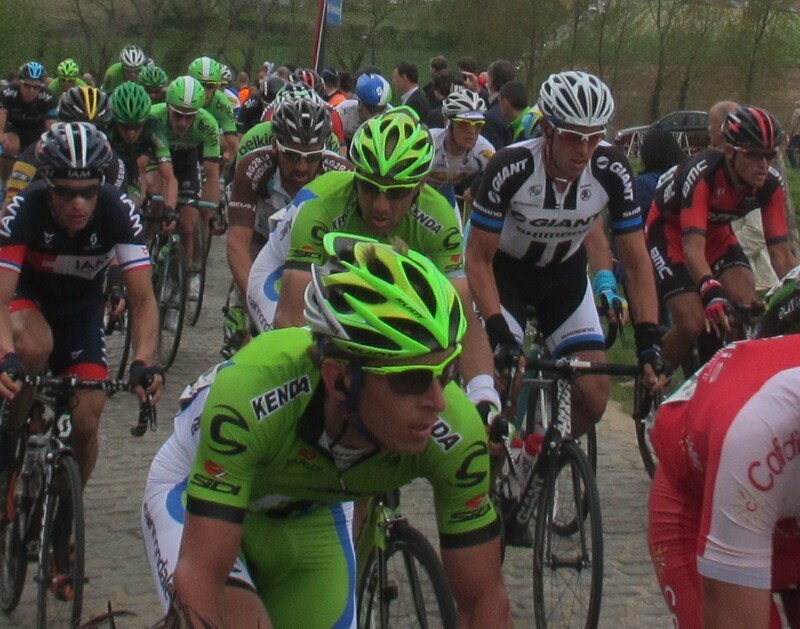 As bike riders ourselves we appreciated how much skill and confidence in each other the pros must have to do that. The day was dark, gloomy and threatening rain so the lights of the cars and motorbikes only emphasised the impression. 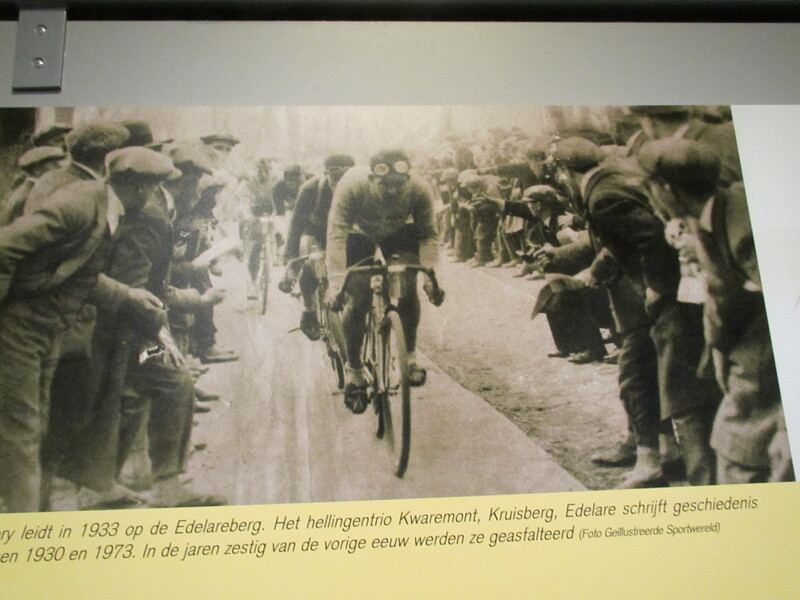 Once they were past us Wouter suddenly suggested that if we were quick we might actually catch them again at the top of the hill because they had to go down, through Berchem and up the long cobbled climb while we “only” had to go up the main road to the top. My legs were aching again from the combination of riding and standing so the other two soon left me behind even though the slope was not steep. However I was soon bumping my bike across the field with the big screen to get to the barriers and see the bunch in time. 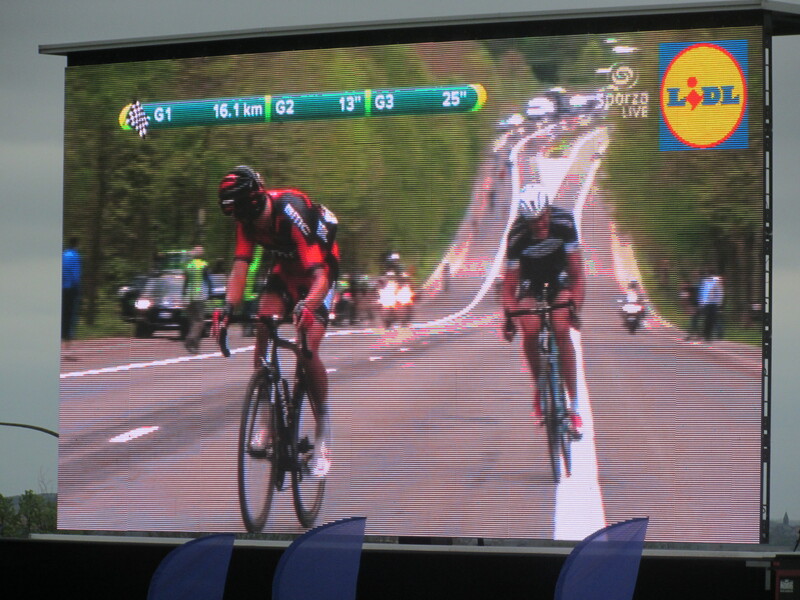 We were then able to hang out, refuel (essential frites) and watch the race unfold on the big screen. 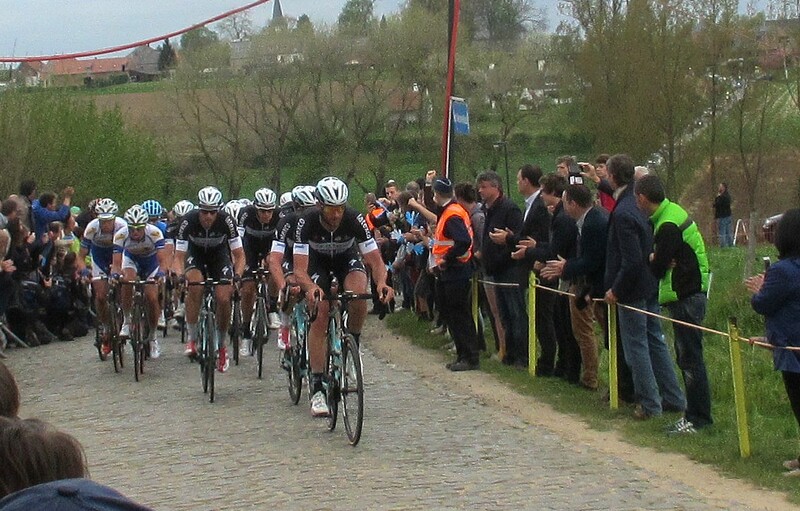 Then with just 20km to go it was a rush to get a great spot by the barriers and hopefully see the decisive moment, then back to the screens to watch them climb the Paterberg and then the run in to the finish at Oudenaarde. The race itself was a cracker. 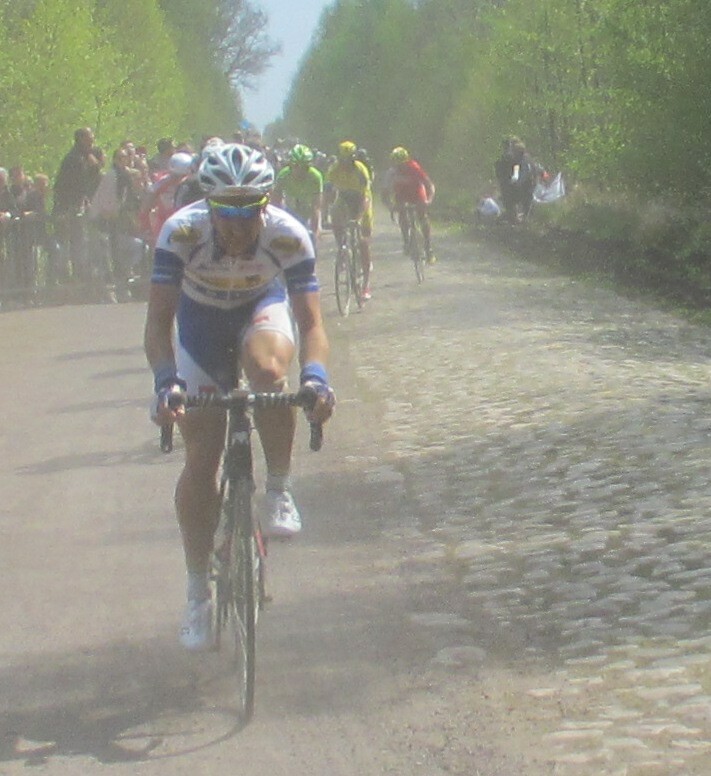 For the first time in three years the two strongest riders of recent years were both fit and the Flemish were very excited about Tom Boonen’s prospects. There were also a host of strong riders from what might be called “the new generation” sniping at the heels of the favourites and several of them are Belgian. The break of the day went away early and held on for a long time but it was clear that on home soil Boonen’s Omega Pharma Quickstep team meant business, they were massed at the front every time we saw them and the crowds were getting very excited. 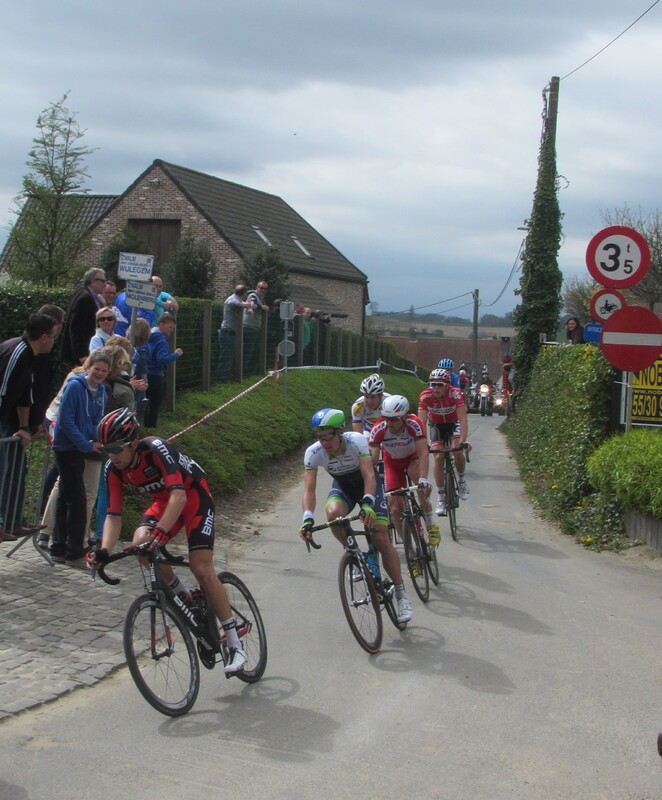 In the final 30km it was the new generation that appeared charge and home fans were excited to see Greg van Avermaet of BMC pulling away in front of us on the Kwaremont with his Quickstep shadow Stijn Vandenbergh, also Belgian, and more excitingly for the locals he was from a village nearby. 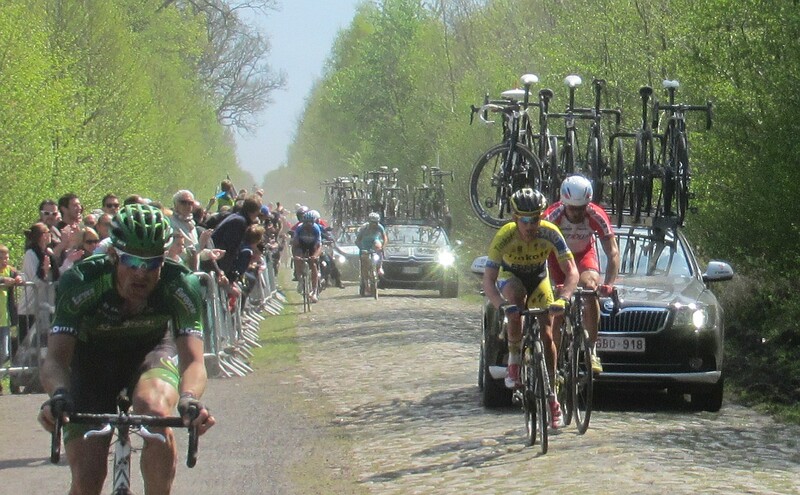 But ominously a pair of riders came up just behind them and one of them was Spartacus, Fabian Cancellara towing Sep Vanmarcke who had pushed him so hard in last year’s Paris Roubaix. In the final 20km we almost saw Van Avermaet get away on the Paterberg and the other Belgians took it in turns to attack but they could not shake off the Swiss master. Every Belgian attack was greeted by cheers and shouts, but to a huge groan from the crowd Cancellara took the sprint from the three Flemish young pretenders. I am sure I had something complicated to say, but it’s all here. 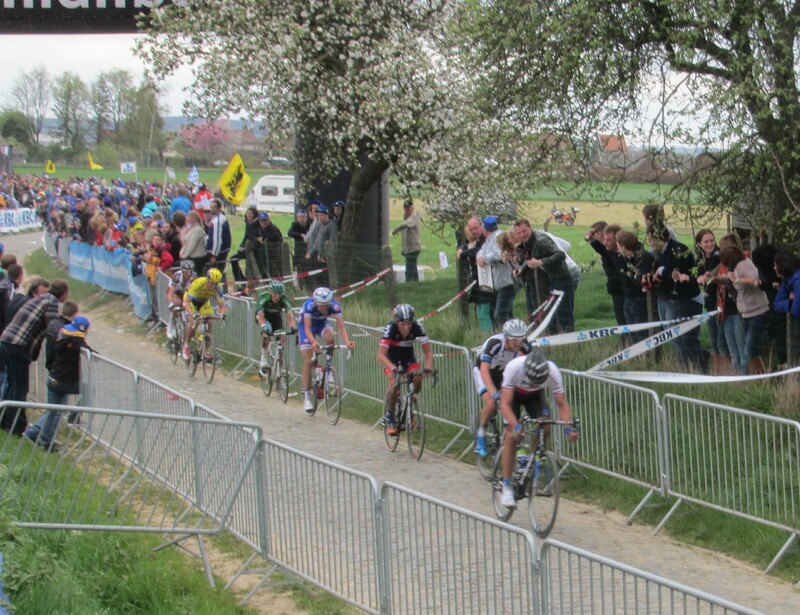 Put simply – every bike fan should come to the Tour of Flanders at least once. 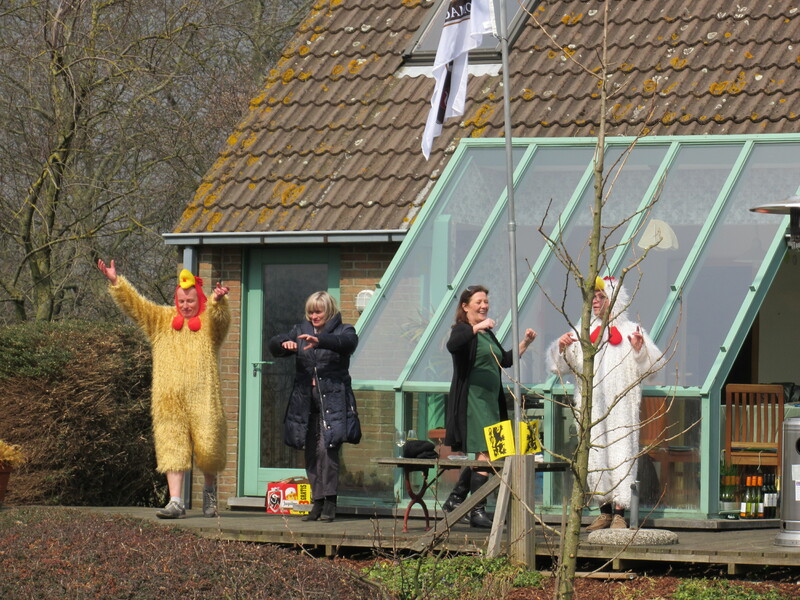 And if you can do it riding in the company of knowledgeable Flemish bike fans you will enjoy it all the more. Thanks Vincent and Wouter – great day out. 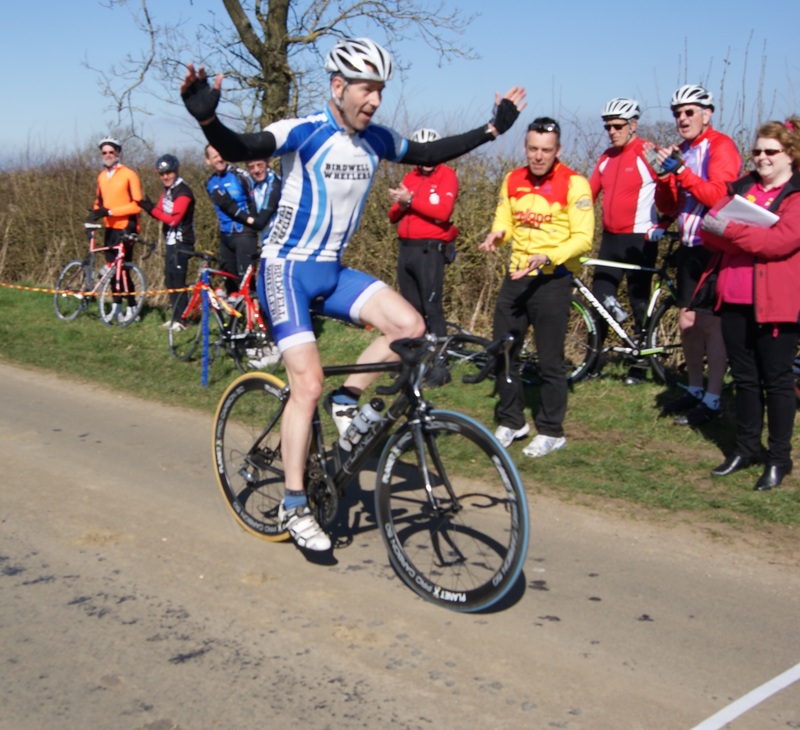 Even those who don’t follow cycling as a sport recognise the victory salute of a winning rider as he or she crosses the line, preferably having dropped your breakaway companions and soloed to the line with time to sit up and do the full arms raised salute. 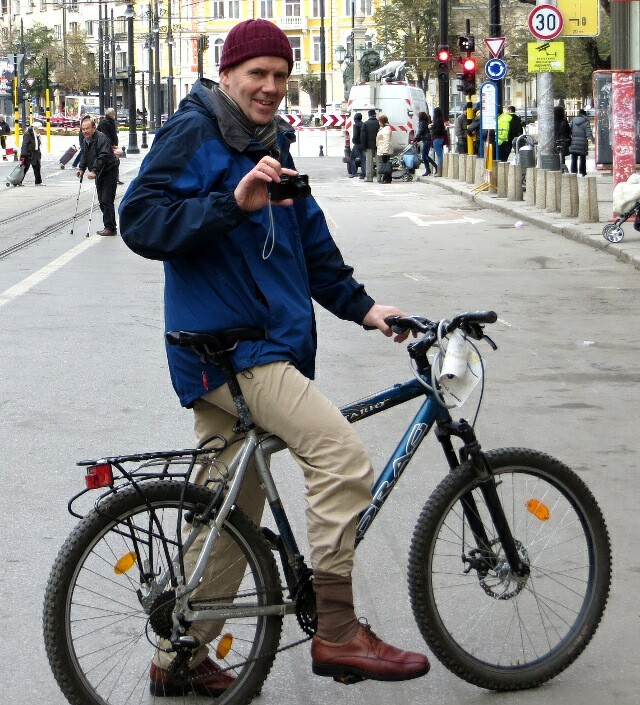 Someone may even take your photo in victory. A much smaller number of people know what that actually feels like, even within the sport. I never did it in about 20 years of racing and I am pretty sure that I am not going to now. Oh sure, I dreamt it a few times and I have certainly felt like I lived every pedal stroke when cheering a favourite rider to a win on the TV. But to actually feel it? I wish. So full credit to my brother Trevor. He still races to a high standard in the UK and in his 50th year he set himself the goal of winning a road race. He has accumulated a whole range of awards and trophies in time-trialing in the past few years but said his season’s goal was a road race. Well he only went and did it in the first event of the season. The wind played havoc in this race and after only 1 lap the field was significantly strung out. A break of 5 established itself quite early containing Paul Caton Trevor Mayne and Karl Moseley amongst others. Mike Twelves attacked from the pack to try and bridge to the leaders , and got within 10 seconds of them before reinforcements from behind came up , these riders included strongmen, Andy Eagers and Jon Stephenson. Eventually, a very strong group of 6 were well clear of the rest. In a move that was a copycat of the A B race, Trevor Mayne attacked in Walton village with just over 1 lap to go. Trevor, an expert timetrialist, pushed on alone to a fine victory by around a minute and a half. All credit to him. And putting any sibling rivalry aside I am not only very proud of his successes, but in this instance more than a little envious – because that’s the way to do it. The only cautionary note is that having completed his season’s target in the first month of the year his excuses for avoiding DIY tasks have significantly diminished. Peaked too soon maybe? However I clearly need the training, so I’m off out on my bike. Maybe I need to practice my victory salutes a bit, just in case. The New Year’s Day ride is a ritual for me, the year hasn’t really started until I have turned the pedals. 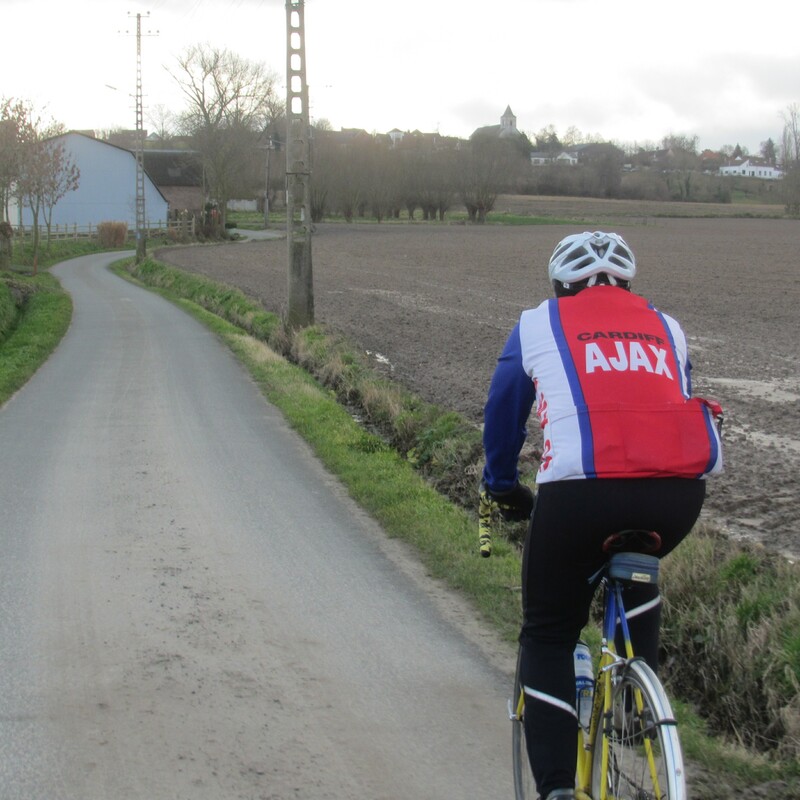 But this year’s ride was something really uniquely Belgian, or rather Flemish. 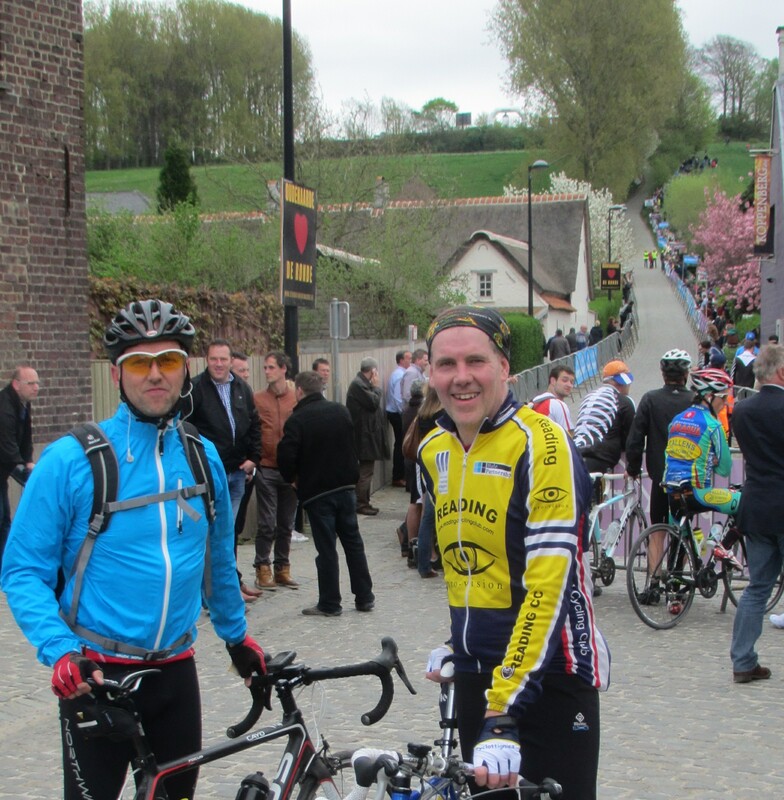 The presence of my Kiwi cycling brother-in-law meant that we had an excuse to finish his stay in Belgium with a classic ride – one of the many marked Tour of Flanders race routes, this one taking in nine of the classic climbs from the final section in the Flemish Ardennes. 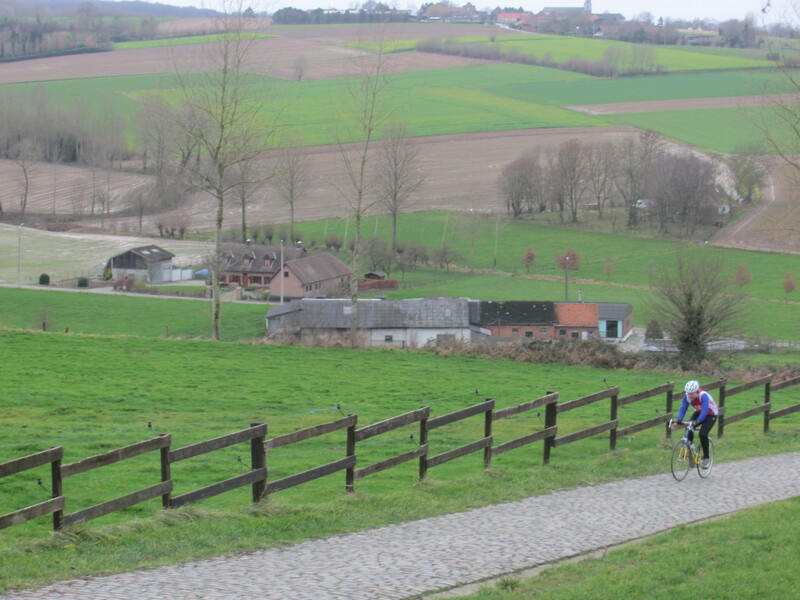 The Kruisberg, Oude Kwaremont, Paterberg and Koppenberg are climbs written into cycling folklore. While I watched the race last year I have not actually ridden them and he couldn’t come to Belgium without trying one of the legends so we had the reason we needed to head off. This would also be payoff for our days of flogging through the rain and mud on mountain bikes before Christmas, this was a treat for the fans. We had a plan to get up early and get ourselves over to Ronse for a few hours of special riding. 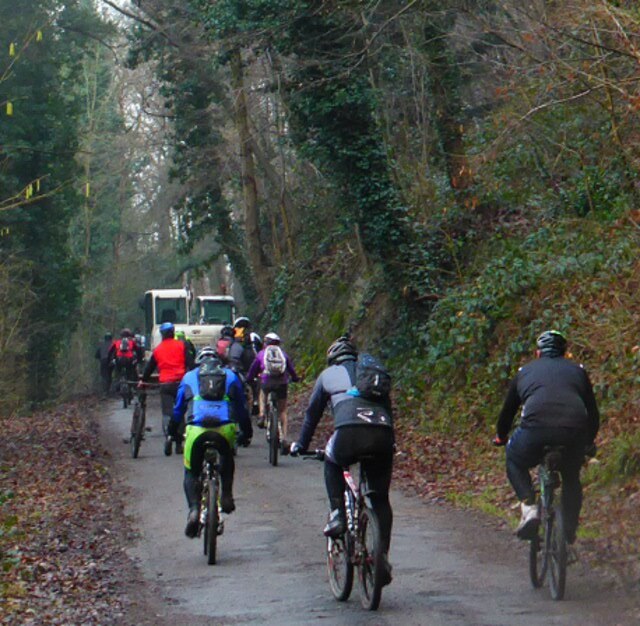 However if you had asked me if it was going to be a top day’s cycling when the alarm went at 8am I would not have been able to give you a very positive answer, New Year’s Eve’s aftermath left me thinking that an afternoon potter through the lanes would be a much more sensible plan. However the requirement of being a good host and the promise of a special route was just about enough to get me going, or rather a pint of tea and a start line coffee did the job. It was an overcast blustery day with rain forecast later so we had to take on the mid-morning chill, but overall it was a stunning ride. 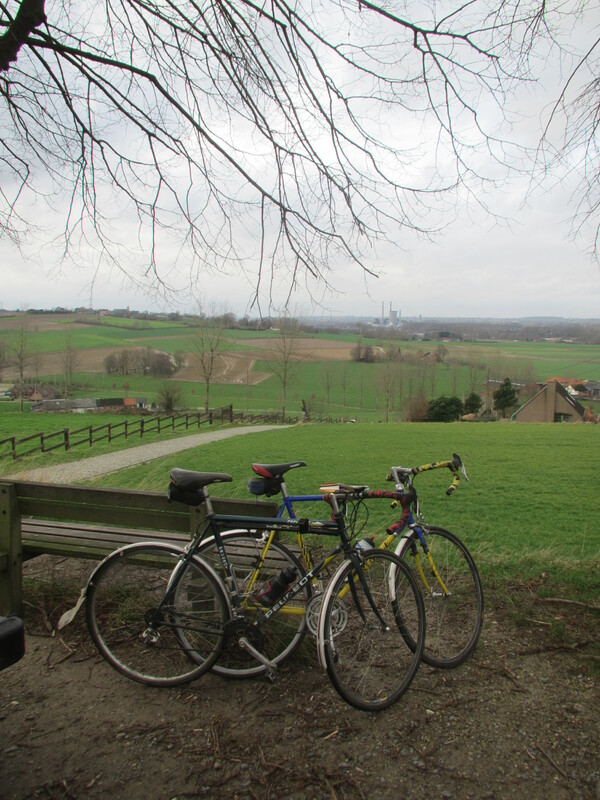 The flat country lanes between the climbs were a bit muddy and horribly exposed whenever we turned into the wind, but provided enough respite to give the hills our full attention and the views from the top were great. Kicking off on the Kruisberg with 1.8km of cobbled climbing up to 9% gradient meant we were plenty warm enough before we felt the full force of the wind on the exposed hill tops. 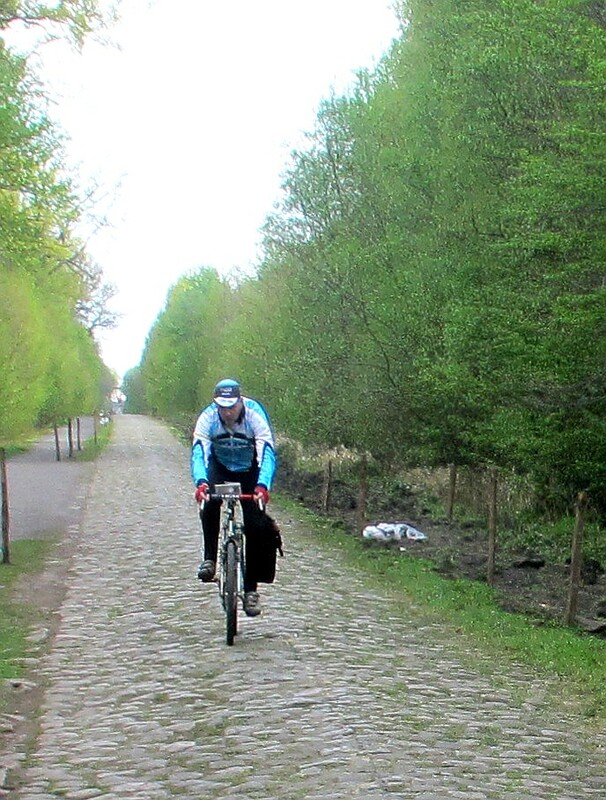 However the Kruisberg cobbles are well maintained and like a carpet compared to what was coming. 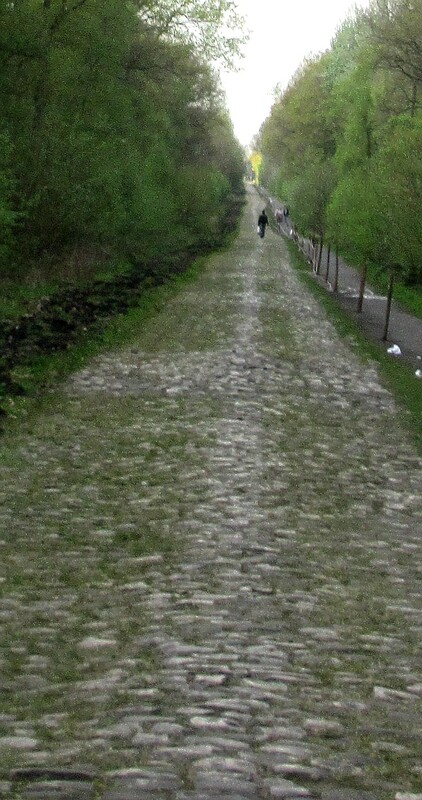 The Monte de l’Enclus wasn’t too steep or cobbled but from when we hit the Oude Kwaremont we understood the challenge. The lower slope was deceptive as the village church could be seen on at the summit and it didn’t look too steep, but the smooth road surface was a trap for the unwary. 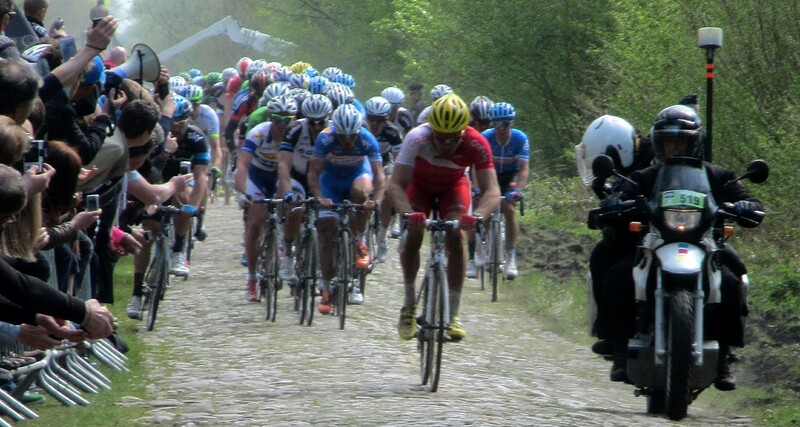 The cobbles soon started and the reality struck. Andrew looked smooth as if he was born part Belgian but I was labouring away finding it very hard to keep my gear moving despite a triple chainset. The key lesson about this sort of riding is that you are denied the fallback of getting out of the saddle when the hill gets steep. As soon as I stood up to get a bit of extra leverage the back wheel started to bounce and all grip was lost, you just have to stay hard in the saddle and heave the pedals round from a seated position. This completely exposed the fact that I have never had that kind of strength, I have always been an out of the saddle climber and it was tough. Andrew found out the grip problem the hard way on the Paterberg when his back wheel just shot from underneath him and dumped him on the cobbles, but as he said “its not as it I was moving very fast”. 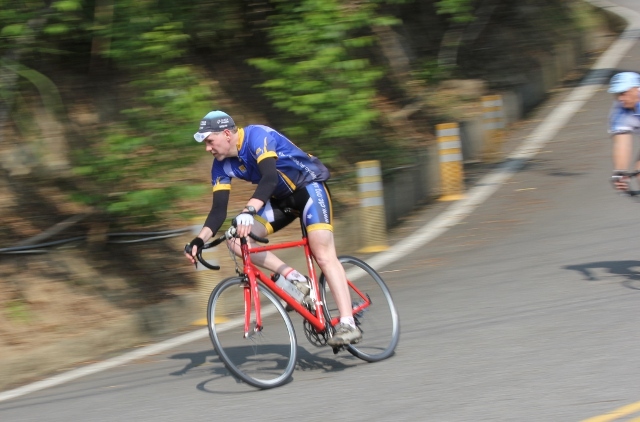 He did get back on and complete the hill – although you can see the effort! 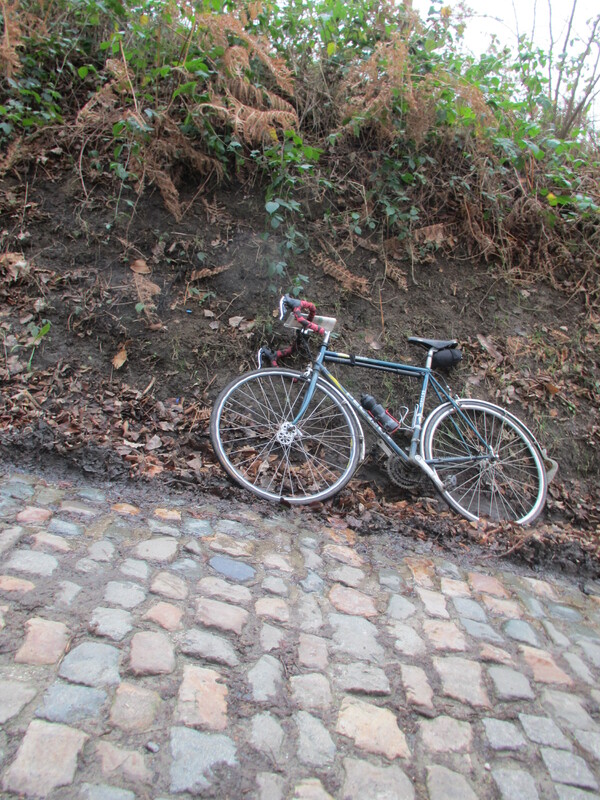 The Koppenberg defeated us both as the big damp greasy stones and the 19% gradient proved an impossible combination with no traction whatsoever. 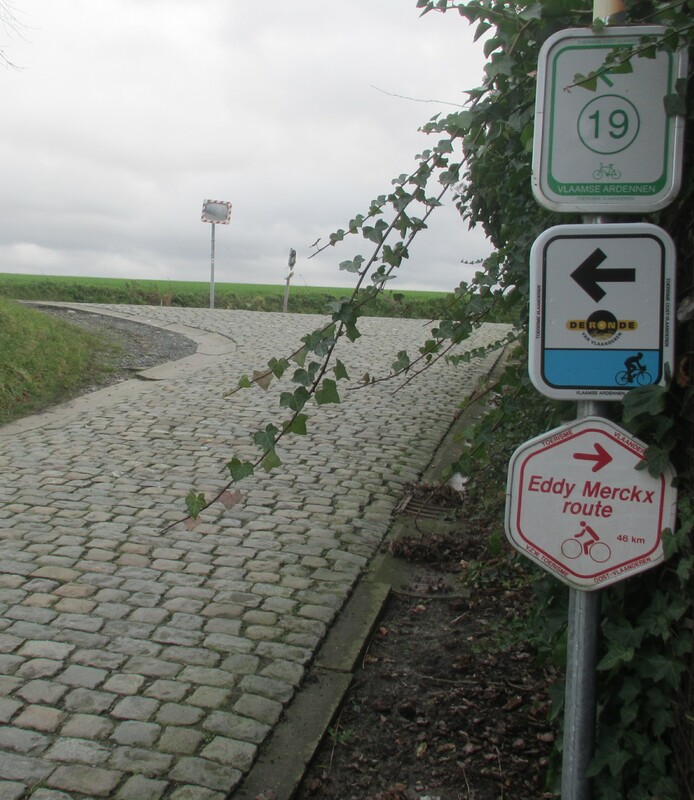 We were entirely philosophical about it as the Koppenberg has seen the majority of the professional peloton walking in the Tour of Flanders, especially when wet. Fans always recall the incident in 1987 when Danish rider Jesper Skibby had broken away from the chasers and fell off on the narrow hill. The race director then promptly ran over his fallen bike with Skibby still on it, apparently to keep clear of the chasing group. Opinion varies on whether he would have done that it Skibby had been Flemish! The descents had to be treated with respect too, the roads were drying out but these are tiny agricultural lanes with quite a bit of mud and gusty cross winds stopping us taking full advantage. But here’s the thing. 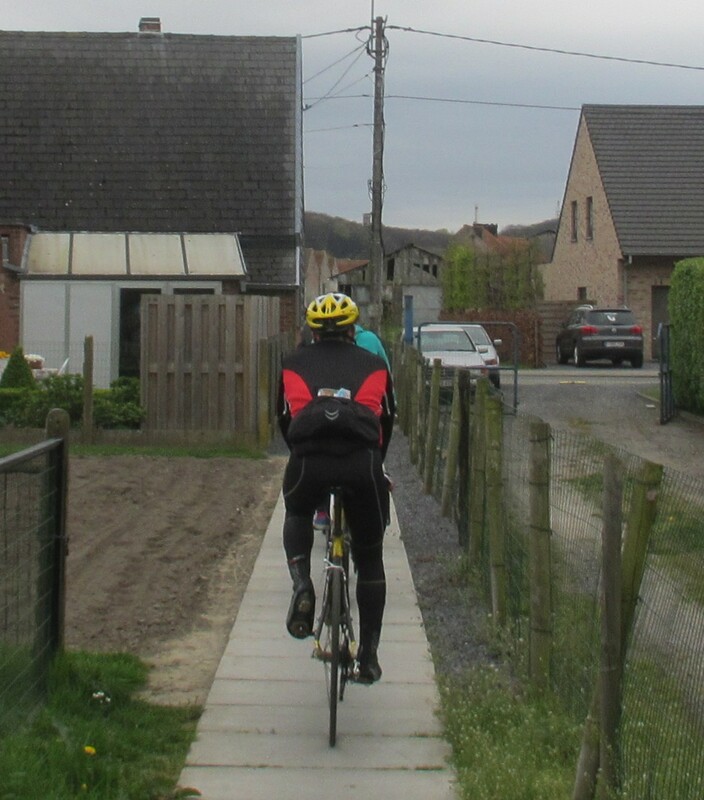 Once again rural Belgium was a cyclists’ paradise. Every climb was car free, we had the complete width of the roads to wobble and wander and on most of the minor roads we hardly saw a vehicle. Apart of the one or two main roads we had to cross we probably saw as many cyclists as cars and those were countable on one hand. However you are never divorced from the cycling heritage round here as this farm’s mural paid testament to the heroes of the nation. It is also entirely possible that we might be considered completely mad by the locals. The sensible Flemish who live nearby can do this every day and it takes an Englishman and a Kiwi to get up early on a cold New Year’s morning to ride De Ronde so they left us to it. 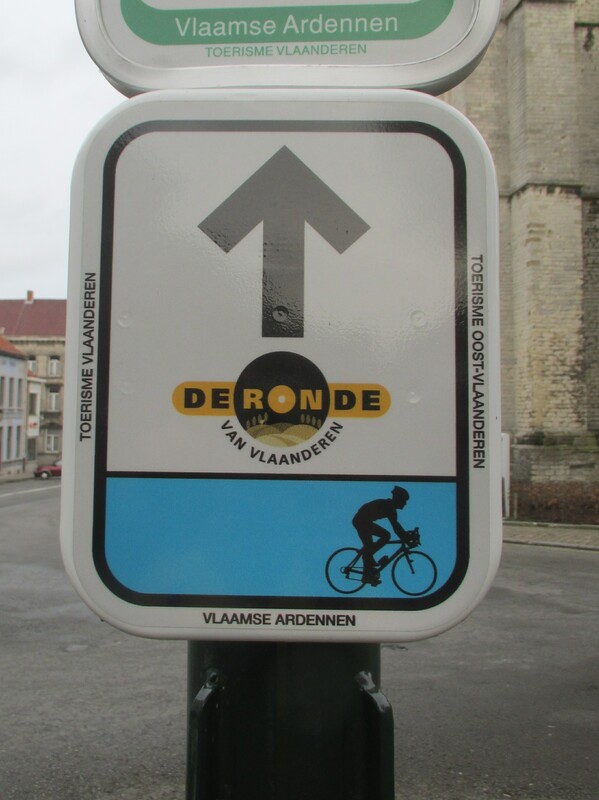 If that’s the case I accept the charge, but I personally can’t think of a better way to make 2014 a special cycling year – christened by riding De Ronde Van Vlaanderen Fietsroute on New Year’s Day.